Thank you so much for this article. I can see you put a LOT of thought and testing into the recipes. I have some brewing in the fridge right now, I have no doubt it’ll be delicious tomororow. Looking forward to tasting my first cup of cold filtered in the morning, using my bodum French press. I gave up a “regular” coffee maker several years ago, preferring a vacuum system on the gas range. I’ve found that it makes smooth coffee, with significantly less acid. This should be interesting. Thanks! This worked splendidly for me. We do this at work during the summers buuut…we don’t mix it with water afterwards. We just throw it into a glass with ice and I usually down the whole thing before the ice melts. I’m trying to make my first cold brewed batch tonight after having a delicious toddy at a local cafe. Just thought I’d throw in that this local cafe adds water to the concentrate and then steams it (just like you would steam milk for a latte). It is sooo good. Not sure if they add hot water or cold water to the concentrate, and not sure if that would make a difference anyway! Thanks very much for the very practical tips, and to everyone for your own experiences. I live by my french press in the winter. Now that the summer days make cold coffee more satisfying I was happy to see a suggestion for using the same gadget to make it. I thought, if a 1:2 or 1:4 ratio of coffee to water makes super-concentrated coffee, why not put my usual amount of coffee and water in the french press, but simply leave it in the fridge overnight? Wouldn’t that give me something I can drink right away in the morning? So I tried that. After 11 hours the taste is perfectly good. It’s on the strong side, but definitely still coffee and not concentrated syrup. I think I’ll keep doing this. That definitely works! One of the benefits of making it more concentrated is that you can brew a large batch for the week. You can also add milk with out diluting the flavor. 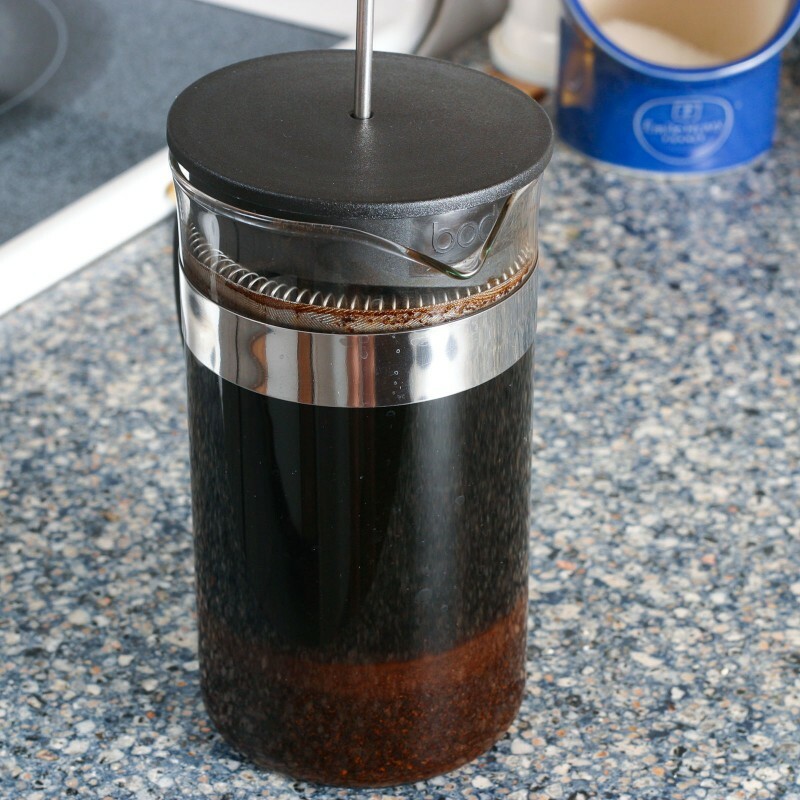 Pingback: Cold Brewing Coffee « Math Rocks! I just bet that if someone had a fine enough mesh strainer, they could do this without any coffee-making devices at all. Just a couple glass jars, really. I have that exact toddy you’ve got pictured here, found it at Goodwill. Mine’s still good but someone was asking me if cold toddy could be made with a French press. Thanks for writing this! You definitely can! You could always use a piece of cheese cloth or something along those lines. I just had the French press laying around so I gave it a try. Whoa!! !…..after reading the article, I MEDIUM (drip) ground some really nice (organic) Brazil beans (from Goshen Coffee) last nite and just finished my first cup of the most awesome coffee I have ever tasted. I let it sit for about 13 hours on the counter top and covered the top with plastic wrap. After pressing down on the plunger/filter of the Press, I used the suggested 1 cup of (drip) ground coffee to 2 cups of SPRING WATER. Hint: the quality of water contributes to your final product almost as much as the coffee bean! I grind my own beans using the cheap, but very effective Mr. Coffee coffee grinder (about $19 thru Amazon.com). Then, as also suggested, I used one-quarter cup of concentrate to three-quarters cup of almost boiling SPRING WATER. Just grrrrrrrreat coffee!!! So non-acidic, smooth and full bodied with a true “coffee” taste. I had been using a Bunn Thermal Fresh unit, and although it makes the best ‘conventional’ java I have ever tasted, it always left that telltale, slightly bitter aftertaste. I checked the websites for a method using my 12 cup French Press and was fortunate to find this site. Thanks so much for the great info! Heading back for my 2nd cup…3rd…4th…..
Great to hear it worked out so well!! The grind size and steeping time affect the coffee so it is good to hear what worked for people. Just made a batch of cold brew coffee using a corse grind of a very dark roast following your method. Ive been led to believe that the concentrate that is made should usually be strong enough to be diluted. I just made an iced coffee with it using the entire concentrate and a small splash of cream and it tastes great but I was expecting the concentrate to last a bit longer than one drink. Am I doing something wrong? or should I expect a cup of coarse ground coffee to make one drink? Besides all that, this method truly does make a great cup of iced coffee. I’m making a bodumful of cold brewed tonight, but since I live in the cold North East US, I like a hot cuppa in the morning. What’s the best way to achieve this? Add extract to cup and add hot water? What if it’s not hot enough to withstand milk? Microwave? Thats great to hear! Out of curiosity, do you know what kind of coffee it was and how finely it was ground? If you want to make a larger batch, you can just use a larger glass container and filter it through a cheese cloth or coffee filter… or the french press in a couple of batches. Thank you so much for the wealth of information! I’ve been toying with the idea of cold-brewing for quite a while now, and just today have finally had time. I’m using your ‘recipe,” and its stewing now! Eleven hours and counting! Last week I read the ingredients in McDonald’s iced coffee. Yuk! Then I found your site. Bought press yesterday, cold brewed last night. HEAVENLY! Thats great to hear! The French Press can also make great hot coffee in the winter too. its a two-fer! love, Love LOVE this method of brewing for making iced coffee! CC’s Coffee House in south Louisiana uses cold brewed coffee to make their iced coffees and they are delish. Unfortunately no CC’s in north Louisiana, just Starbucks and a few independent coffee/wifi cafe’s that ice down hot expresso to make iced coffees. Cold brewed is infintely better! Now I make my iced mocha caramel coffee at home and it is fantastic. Thanks Luke! I have bought my son a french press and all the stuff he needs to make iced coffees at home as he is addicted to them. Not sure if it’s much cheaper, but iced coffee on demand rather than driving halfway across town to get it (he lives in south Louisiana) can’t be beat — and you don’t have the hit and miss flavor wise depending on who is working at the coffee house at the time! After 3 years this blog is still making a difference to coffee drinkers. WTG Luke!!!! Thanks for the post, I’ve been doing this for a week or so now. I think I might be doing something wrong, though. While the coffee tastes great, I need to put about of third of a cup of extract into each mug of coffee to get it strong enough. Consequently, I go through the two cups of concentrate in about three days (two mugs of coffee per day). When I brew it hot, it only takes 1 tbs of grounds per mug. So I’ve switched from 6 tbs in three days to 16 (one cup). Does this sound right? I mean, I like it better, but I’m not sure it’s three times better. Thanks! You know, that is a good question! I have a couple of thoughts. I wonder if you tried a strong roast of coffee if the concentrate would be stronger. Another thing to try is letting the brew steep for longer. I don’t I remember having to use as much concentrate when I did. I am going to start making cold-brew coffee again, so I will update this with the ratio I end using and try to figure out how many TBS it takes. Thanks, Luke. I’m letting it steep a little longer (14 hours instead of 12). That seems to be helping, I only need three tbs now. I’m also buying the cheaper pre-ground coffee. So those two combined have my costs back to where they were before. Anyways, thanks again for this recipe. I mostly use it for hot coffee, but it’s helped a ton with my heartburn. Found you after doing a google search after forgetting where I read an article about cold brewing via french press for iced coffee and this is even more helpful than my original (lost) source! You are being shared on facebook too! Thanks! Happy you found us again. I think it is Iced Coffee Season again! I have several presses of different sizes, but my favorite for iced coffee is the (Bodum) Chambord 8 cup (1L). I have a spare beaker and keep the ‘cage’ it goes in loose enough so it slides out easily. So basically, with nothing but the glass beaker, I add 160-180 grams of slightly coarser-than-drip, medium-ish roast (can’t stand roast flavor, personally) good estate or single origin coffee. I then saturate as much coffee as I can with cold water up to the spout, wait a few minutes for everything to settle/bubble (the water level usually drops as the the liquid works its way down there), then top it back off. Next, it gets covered with plastic wrap or whatever, with NO STIRRING before it goes to rest at room temp on my counter, away from direct sunlight. 8-12 hours later, I uncover it, give it a good stir with a spoon to let the rest of the grinds settle and then I scoop the foamy stuff off the top (gives clearer taste IMO) and discard that in the sink/compost. I put the beaker back into the pour ‘cage’ (or sometimes not, if I had never removed it in the first place), the plunger goes in and then it’s carefully strained. I make it a point to use it within a week since the oils tend to get a little weird for my tastes when left in the fridge for longer. If I need to make more at a time, I simply use an extra beaker for the same size plunger and do two at the same time, straining as needed. If you’re a fresh-roasted, grind-it-at-home fanatic, cold-brew is great for any coffees you might have floating around that are two weeks off roast or more. I just want to thank you SO much for publishing this method. With GERD, hiatal hernia & Barrett’s esophagus, I thought my coffee days were over forever. I haven’t had a cup of coffee in almost 2 yrs and missed it so much. Thanks again! perfect. I’m trying it tonight! How long does it keep in the fridge? It should be good for about two weeks if you keep it in an air tight container. It starts to taste a little stale towards the end. If you mix it with milk and sugar it is tough to tell the difference though! Hi there – I just bookmarked this page and have been experimenting with cold brewing coffee using your French Press method. Thank you for posting this. Even two years later, people are still finding this article helpful! This sounds really great. After a move, Ihaven’t been able to find the plug & the filter from my Coffe Toddy was not usable anymore. The store where I originally bought my Coffee Toddy went out of business & I haven’t been able to find a place the carries the Coffee Toddy or replacement parts. I can’t wait to get home & try this out. I do have a functional french press. Thanks. Just bought my Toddy on Amazon. All replacement parts are also available there. Borders books sells the parts. Hey, this sounds great! I don’t have a coffee maker yet, so I probably won’t get one now. I’ll try this one out first. French Presses also make great hot coffee! This is a great alternative to using the Toddy system. Lots of people use dark roasted coffee in a drip-brew since it’s smoother and has less acidity, but if you’re cold brewing, you might want to try a medium or light roast since cold brewing makes a smoother brew anyway. FOr cold-brewing, I’ve been told to use a medium roast. Is this true? What is your preferred roast for cold coffee. We usually just go for whatever is on sale. I think it usually is a medium roast coffee though. When you cold-brew coffee in a french press, if is seems to be murky or dirty, strain it through a normal coffee filter and all the dust will be gone. i’ve also cold-brewed using an iced-tea pitcher, some cold water, and a fine cotton bag with the grounds in it. Squeeze the bag out after 12 hours and you got yerrselfff some fiiine cold brewed coofffeee! 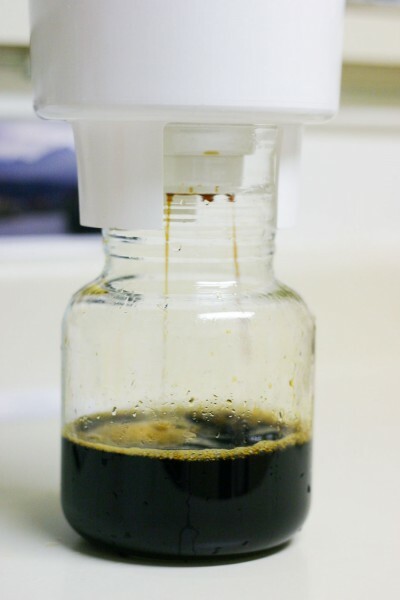 Cold brewed coffee is much healthier than hot brewed. Hot brewing causes the fats and oils to be extracted from the coffee. You can also add hot water or steamed milk to the extract for a hot version of toddy that has less acidity than regular coffee. Same here. GO TO ROSS’s they have french presses for 6 bucks right now! It really brews a nice cup. I just found a small French Press at Ross Dress For Less. I’ll have to give your recipe a try. I have been hooked on iced coffee this summer. I have a Saeco machine. I make a large espresso, pour it over a lidded container with Splenda and ice and give it a good shake. I then pour it into a glass and add a splash of milk. I’ve been making this as regular strength coffee rather than as concentrate. I just grind up about 2/3 cup of beans in burr grinder to course grind, add them to the French press (the same model pictured above, oddly enough), fill with water and refrigerate overnight. My wife and I just add creamer or half and half in the morning. I haven’t tried regular ground coffee, but Whole Foods “Pleasant Morning Buzz” (a fairly dark roast) has been working really well. I love iced coffee and am looking forward to trying this. But I have one question. Do you let the coffee brew overnight at room temperature, or do you put it in the refridgerator? How many ounces total is your press? Different presses seem to measure a cup of coffee any where from 6-8 ounces. thanks I love cold brew toddy! Yea, I have wondered if heating the water first might bring out more flavor. I think some of the problem with doing that is that it will also bring out some of the bitterness and off flavors that you get in over brewed coffee. It could be worth a try though! I know we are using a cold brew method but couldn’t help wonder about the impact of starting the initial brews with increasingly higher temperatures of water. Just left your Cook’s Illustrated recipe for great bread and began to search your site when I chanced upon your cold coffee extract. I remember sipping cold coffee (from the refrigerator) mixed with milk and sugar during really hot, muggy summer days. Totally refreshing and you can really taste the coffee. I’ll use my Bodum for your recipe real soon. Yep! you add a whole cup of ground coffee. The coffee extract you end up is really strong though. You only need a couple table spoons of the extract to make a cup. Mix it with hot water, or some milk. I’ve been dying to make some decent coffee with the rubbish pre-ground crap I get – this sounds fantastic! Just one question though – you put in one whole cup of coffee grounds?? I’m giving this a try tonight!